It’s profitable and easy for a website developer to start an e-Commerce web design business in Bangladesh. Despite being much easier to build a website from content management and template platforms, many businesses prefer hiring a professional web designer to build and manage their sites. Also, several different web designs will continue to be made for years to come that invariably implies. This is because you can start an e-commerce web design business in Bangladesh if you’re an expert in this field. Or, you can hire web designers for your business when you’re unable to perform all tasks alone. Moreover, after acquiring relevant skills or gaining experience, many designers will think of kick-starting their own web designing company or start working as a freelancer. It requires strategic thinking, the tenacity of purpose, skilled and thoughtful efforts at converting your dream into reality. It’s assumed that more than 50% of Bangladeshis are using the internet for various purposes. These include education, entertainment, shopping and many more. When these terms are coming one after another, they are taking many prospects for Bangladesh. And e-commerce web design business is one of them. For example, if some people buy products from the foreign online shop then you can think to open an e-commerce website on your own. But, you’re not an expert to build a website and you’ll run to a website designer. This is the route and needs that lead to starting a business of e-commerce web design. The business has a great future in Bangladesh as there are growing numbers of e-commerce businesses. That’s why you can start this business and likely to successful accordingly. As web design encompasses many different skills and disciplines in the production and maintenance of websites, e-commerce web design relates a website for e-commerce business. And interface design; authoring, including standardized code and proprietary software, user experience design, and search engine optimization are differs from a common website. Although some designers will cover them all, many individuals will work in teams covering different aspects of the design process. They are also expected to be up to date with web accessibility guidelines if their role involves creating mark up. Also, it’s a broader scope of web development as e-commerce web design partially overlaps web engineering. 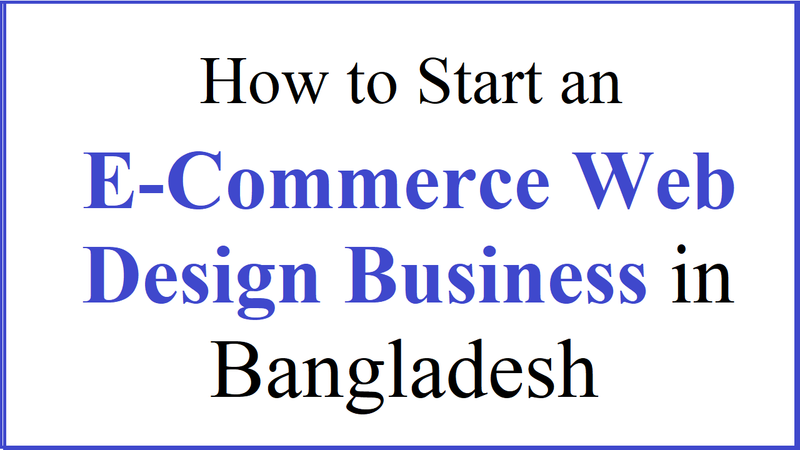 Well, let’s know the steps to start an e-commerce web design business in Bangladesh. It’s the perfect time to write your business plan for your competitive research complete. To determine what to prioritize and how to effectively reach new customers, a business plan is vital. You’ll need to walk through the options and develop a plan of attack to make the business successful from retaining search engine rankings, to developing custom functionality. As you’re offering services to people, it’s senseless to offer people what you’re trying to sell without first knowing what they are looking for. You should provide such services to them with a professional finesse after knowing what your clients are seeking. Also, you can do the thing whether they would like you to provide your necessary requirements. Although it isn’t undercharging or working too cheap, there is one trick to being booked solid with a full pipeline of new web design clients waiting in the wings. They are simply looking for experts whenever clients are looking for website design service providers. So, your profile should contain your credibility to the world. And it will give people the opportunity to trust your services, which is another advantage to it. Moreover, while consistently posting visual contents about your work in your area of expertise and sharing your views on the latest industry trends that’s another way of enhancing your credibility. Because people would like to know the design of your website before thinking of hiring your services, you need to have an attractive website design. That’s why your website must be an attractive one as it will represent you to your potential clients. This way you’ll gain graphic design jobs with your prospective clients. As it’s the next logical step, you need to have the most effective landing pages, sales pages, and calls to action to focus on one thing. For example, you must not ask someone to marry when you meet for the first time. Better to ask him or her on the second date, which is more preferable. That’s why it’s important to keep in mind to avoid doing too big tasks at the early stage of your e-commerce web design business. So, it’s better if you focus on the best next step. You need to become an expert at one thing because savvy clients seek out experts if you want to attract web design clients like crazy. It’s not that you can’t be good at a lot of things or offer a variety of services having a specialty. And followed by the other services like add-ons or upsells, you’re able to lead with your specialty and focus on your specialty in your marketing effort.